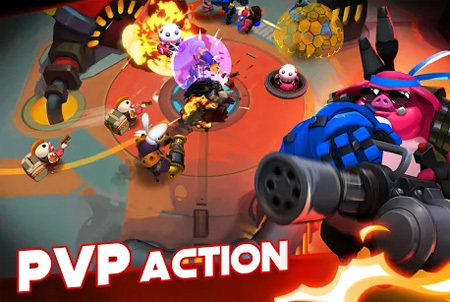 Wild League is a unique action game from AI GAMES FZ. It takes place in an outdoor natural arena where two groups of wild, heavily-armed animals fight for water in 3х3 MOBA battles. Protect yourself from wolf packs attacking your territory, keep enemy claws off the water in the center of the map, and don’t let other players collect bottles of water. The game features more than 10 different animal characters, from the massive and powerful Buffalo, to the cunning and stealthy Cat. Each hero has its own characteristics to help you dominate on the battlefield. Choose from a variety of pre-selected weapon types, including tons of guns, special abilities, auxiliary turrets and support units. If you get stuck in the game, check out the video walkthrough and gameplay for the game. This entry was posted in Android Games, iOS Games, Mobile Games, Walkthrough and tagged Wild League Cheats, Wild League Game, Wild League Gameplay, Wild League Guide, Wild League Hints, Wild League Review, Wild League Solutions, Wild League Strategy, Wild League Tips, Wild League Walkthrough by Marvin. Bookmark the permalink.